Compressing a 700+ page novel into a 10 episode series is no easy task. That’s 70 pages of material in one hour. There is a lot that goes on in the book, and while making the book a TV series is the best way to represent it to encompass as much information as possible, producers David Benioff and D.B. Weiss still had to cut corners to make both budget and time restrictions. So after both watching the series and reading the book, I’ve managed to find some key differences in scenes. I kinda hoped I wish I had a pen and notepad while I read to truly find every nitpicking detail, but I’ll just try and recall the biggest things off the top of my head. Obvious spoilers, bah doy doy. Spoilers contained within the first book. Robb is one of the two Starks that didn’t have a narrative in the book. Because of this, his only exposure in the series is through other character interaction that include Tyrion and Catelyn. Despite this, he makes multiple appearances throughout the series, even probably being one of the main story lines to follow. We don’t get as much of the emotional or character development in the book as we get in the series. Which I personally think is a better thing. And I hear they’re going to continue doing so in season 2, even when Robb practically isn’t in the book at all. Are Robb and Jon actually 14? 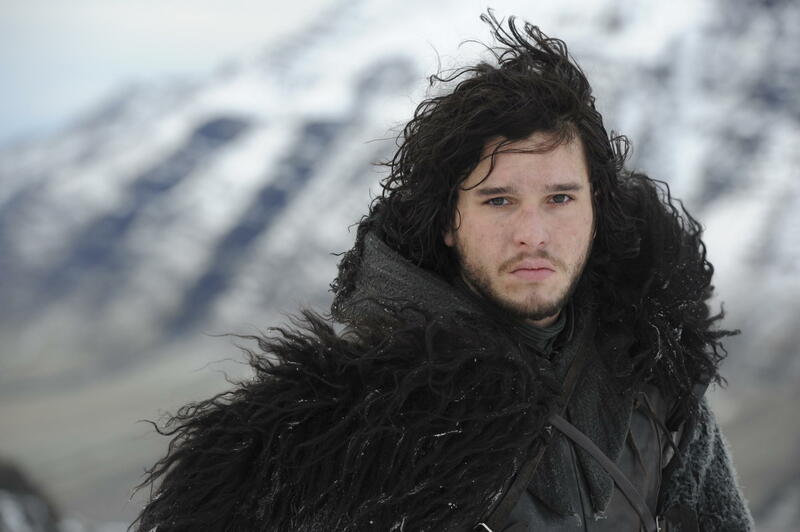 The first big thing that shocked me was when I read that both Jon and Robb are only 14 in the book. Shoot, I thought they were like 25 in the television series. It makes it even crazier about what they’re accomplishing at such young ages. There is a lot more weight carrying when a 14 year old boy is leading an army of 20 thousand men than what we see in the television series. The book makes a big deal about how Robb is still using wooden swords only to have him a few months later commanding armies. The television series does a lot better job in characterizing who Jaime Lannister is than the first book did. I’ve only read a couple pages of A Storm of Swords, but I’ve also seen the Jaime is now a narrator in the third book. So I’d imagine the producers are taking the characterization from the third book to apply how he acts in the first season. I’ve even seen an entire conversation from the second book moved to the first book that involved him and Catelyn Stark. I personally like Jaime. He seems to be good friends with Tyrion despite his affliction, and anyone who is okay with Tyrion is okay with me. 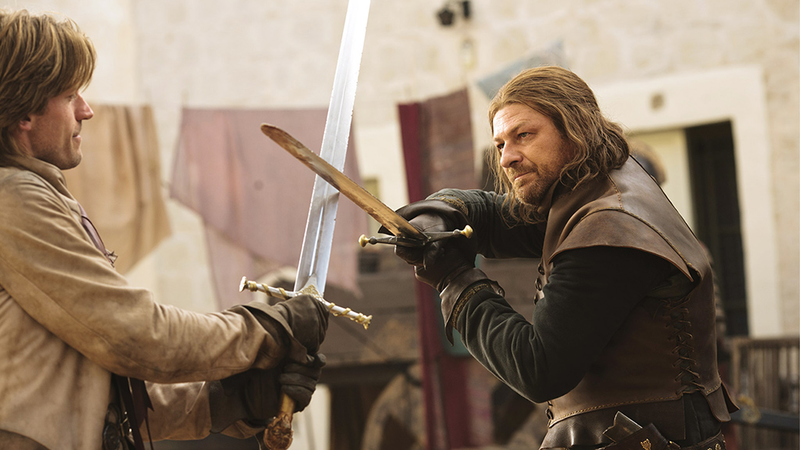 The characterization is further continued when Jaime Lannister duels Ned Stark instead of simply sicking his guard on him. It shows how power hungry he is and how he feels as though he needs to prove himself. Further characterization occurs when he talks to his father Tywin. On a similar note, it was also good to get some characterization of the head of the Lannister House. There are only 8 viewpoints/narrations in the book. There are over 30 ‘main characters’ on the show. So aside from the conversations we hear that are direct texts from the book, there are a plethora of conversations that happened on the television show that aren’t documented in the actual book [with hopeful approval from George R.R. Martin himself]. 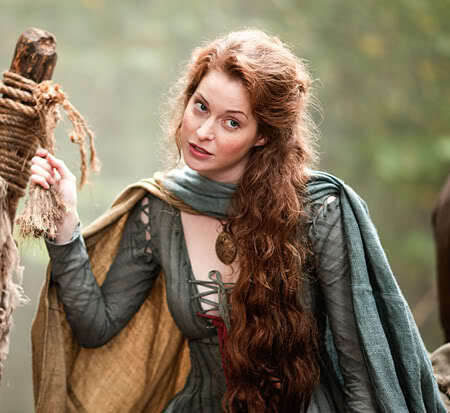 Some include Grand Maester’s Pycelle’s womanly visit [see Roz the Whore below], the serious love talk between Robert Baratheon and Cersei Lannister, Varys and Littlefinger banters, and many, many more. I rather enjoy these conversations I never saw in the book because when I was reading the book after watching the series, I pieced together underlying motives with immense satisfaction. Absolutely no trace of her in the books. Unless I was completely oblivious. But I think she serves a greater purpose as one character than majority of the other characters. I think the producers used her as a median to get across multiple points from the books that couldn’t be displayed through the TV series due to time restraints. We characterize Theon Greyjoy, Petry Baelish, Grand Maester Pycelle, Jon Snow & others through her womanly ways and conversations that occur explain entire chapters to add to the mythlore of the universe of Westeros. I look forward to her use as a metaphorical medium in season 2. And her use as a whore. Had to be said. She’s pretty gorgeous for a whore. The big difference with Littlefinger telling Sansa the Hound’s story vs he telling her himself is that it shows the character’s sense of closeness with Sansa. He obviously feels something towards her, something that is close to nonexistent in the series (aside from the look he gives her as she contemplates jumping from the castle walls). It creates a different dynamic in their relationship from the outset. The series just doesn’t do that as well.